The ASL classes offer introduction to basic skills in American Sign Language (ASL). You will learn how to understand and communicate with your eyes and hands, and will develop basic skills to communicate with the deaf and blind, and be able to have a conversation with your deaf community. When you are able to communicate with a deaf person on 5 different subject matters for 15 minutes, you will receive an ISDHH Sign Language Certificate. We will restart ASL classes after Ramadan InshaAllah. 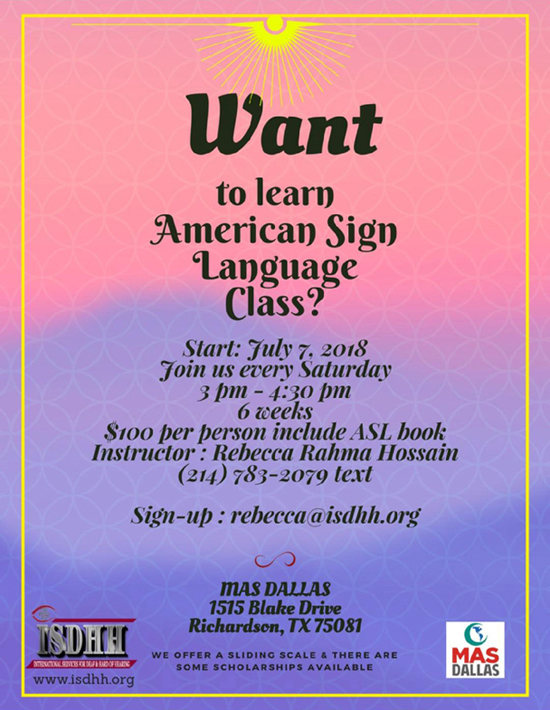 Previously, ASL classes were offered at Valley Ranch Islamic Center and MAS Islamic Center of Dallas. Here is a video that shows what you will learn from these ASL classes. This is a video of Yasmina - a revert Muslim who was teaching ISDHH volunteers ASL on a video she made before they volunteered for our ICI and IANT events, and other events we do. Below is another video of what ASL classes will entail. This is the video of Zainah (Amina Papa's daughter) rehearsing her ASL performance for NTD/ISDHH first InterFaith event at ICI. Please fill out the form below to register for ASL classes. Thank you! Islamic Services for Deaf & Hard of Hearing is a 501(c)(3) non-profit organization that promotes and empowers the Deaf to become LEADERS in their communities through Leadership, Education, Advocacy, Determination, Excellence and Servitude. © 2019 Islamic Services for Deaf & Hard of Hearing is a registered trademark. All Rights Reserved.